What's your take on tees with messages? Although I personally like florals and bell sleeves, sugar, spice and everything nice, the summer has made me a t-shirt person. 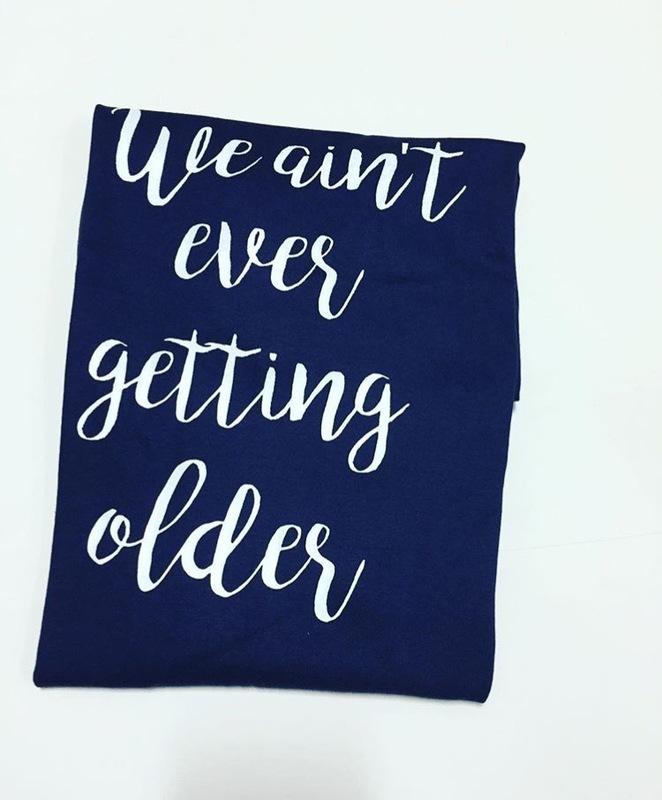 I was thrilled to see this tee on my doorstep that said "We ain't ever gettin' older", a line from one of my fave songs, "Closer" by Chainsmokers! So this navy blue tee was sent to me by Print Octopus, one of India's finest e-commerce stores that let's you print on stuff! They have a fabulous collection of T-shirts, Phone Covers, Posters, Canvas Prints and Mouse Pads with the funkiest designs that will blow your minds. Most of their stuff are categorized by themes. So if you're a fashion buff, you have tonnes of things to explore! Or if you're an Ed Sheeran fan, how about a tee that says "Shape of you"? You can customize your merchandize to your needs, upload your design, create your product and sell it too! How about that, huh? The quality of the products is beyond amazing! I honestly did not expect it to be so comfortable and soft! The print on the tee is crystal clear as you can see and what I like best is the cute octopus logo :D Why don't you guys check out all the products available at Print Octopus? This tee has become a part of my everyday wardrobe. I wear it to work, to the gym, to sleep and here's a simple look I created with it. I wore my fave pair of denims from H&M and my colorful flip flops from Max on a hot, sunny day at Coimbatore. That's all for now. Have a great summer!